A subset of the plant-based world is the “raw” community, which consists of women and men whose diet is almost entirely comprised of uncooked foods. In addition to high amounts of raw fruits and vegetables, the raw vegan diet contains a number of creative recipes that call upon the use of nuts, seeds, spices, and herbs. 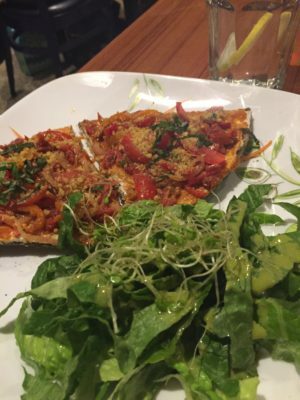 For example, when Nature Has Flavor Podcast host Danny Horgan visited a restaurant in St. Petersburg, Florida this winter, he ate a “raw vegan” pizza, which had a hemp seed- and cashew-based crust. While veganism is often considered extreme, raw veganism gets labeled as downright crazy by the mainstream public. The diet is thought of as incredibly restrictive, as raw foodists only eat plants found in their natural form (meaning almost all forms of cooking are off the table). The theory behind eating this way is very much philosophical. Without ovens and microwaves, people in tropical climates relied on raw fruits and vegetables for most of human history. Why should we be any different in 2016? Eating raw fruits and vegetables can be incredibly beneficial to the body. Nature has balanced vitamins, minerals, amino acids, and sugars in near perfect combinations, and it’s next to impossible to replicate the synergistic effect these nutrients have in plants. Therefore, we at Nature Has Flavor recommend that everyone incorporate some raw foods into their diet. Raw carrots, lettuce in salads, and apples are great picks. But as valuable as raw foods are to the human body, we also recommend that people incorporate cooking into their lifestyle. Unless you’re an avid raw foodist who thrives on that lifestyle (in which case we encourage you to carry on and enjoy! ), here’s why we believe cooking is so important. Raw food can taste amazing, and there are so many amazing recipes that call for only raw ingredients. However, the general consensus among chefs around the world is that the world’s best flavors are unlocked through cooking. Baking, sauteing, and steaming are just some cooking methods that can maintain food’s nutritional value while enhancing its taste. After preparing the gourmet recipes you’ll find in Nature Has Flavor: Cooking Your Way to a Healthier Life, we’re confident you’ll agree with us. For hundreds of years, cooking has brought people from all walks of life together. There’s a unique element of love that goes into cooking, and the intangible feeling we get from preparing a meal for someone close to us is truly special. What’s more, many foods we find comforting are served at higher temperatures. Nothing warms the soul like a nice hot bowl of soup or stew. By learning how to cook, you can bond with family and friends over one of the most enjoyable and rewarding activities in the world. Cooking not only makes healthy foods more palatable — it also makes them more digestible. Many plant foods, particularly vegetables, are difficult to digest because of their fibrous texture. Cooking vegetables can allow our bodies to spend less energy on digestion while unlocking maximum nutritional value. Cooking also allows us to eat a better variety of foods including rice, pastas, lentils, beans, and more. If you’re considering a plant-based diet — raw or otherwise — Nature Has Flavor is here to help. Our premium cooking ingredients are sourced in small batches from trusted vendors around the world. Check out our holiday packages and take your own healthy cooking to the next level.